Prohibition Agents Frank Allen Mather, James Enoch, Marvin Fisher, J. S. Palmore, J. S. Payne and J. M. Gilliam, accompanied by Deputy U.S. Marshals and state constables, went to Russellville, KY, to execute search warrants. They planned to raid a number of locations where undercover agents had previously purchased liquor. At the residence of Willie T. Thomas, agents found a still and arrested eight violators. The prisoners were all placed in one room within the house under the guard of Agent Mather and a Deputy U.S. Marshal while the others left to continue with additional raids. Sometime later, local officers unexpectedly showed up at the residence, all apparently under the influence of liquor and in the ensuing confusion, shots were fired. 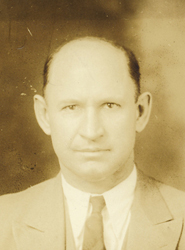 Agent Mather was seriously wounded and Bluch Soyars, a special deputy sheriff and also the Russellville Superintendent of Water, was killed when he attempted to release the prisoners. Agent Mather was taken to the hospital, but died the following morning. 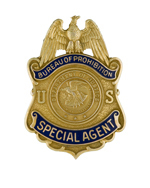 Agent Mather joined the Prohibition Unit on June 1,1921, with an annual salary of $1,500. He carried badge #1955. Agent Mather was born in Hodgenville, KY. He was survived by his wife, Mary Ann (née Washer) and three children, including two sons, Sylvester and Otis.